The Detroit Red Wings skate through a drill at their practice before 6,000 spectators at Kelowna B.C. 's Prospera Place on March 17, 2010. 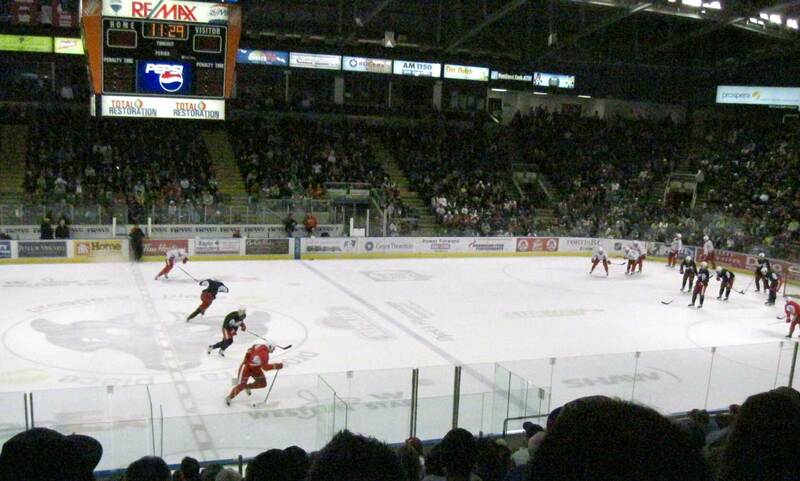 Kelowna got to have a little love-in with the Detroit Red Wings this morning. The NHL team, three points up on the Calgary Flames for the final Western Conference playoff spot, is in the midst of an unusual three day break. They played Monday in Calgary and won’t play again until Friday in Edmonton. But rather than stick around Alberta, the Red Wings took a quick jaunt over the border to Kelowna, B.C., 900 kilometres southwest of Edmonton. Kelowna is home to the Western Hockey League’s Rockets, one of junior hockey’s more storied franchises (four Memorial Cup appearances in seven years) and the team’s owner, Bruce Hamilton, is reported to be well regarded in NHL circles. Kelowna is also a popular resort town that sees a lot of pro players drop in for a little R&R during the off-season. This morning, the Red Wings held the first of their two practices at the Rockets home rink, Prospera Place. Local hockey fans lined up to get into the arena hours before the gates opened at 10 a.m. for an 11. a.m. practice. When all was said and done, more than 6,000 people, a near capacity crowd, watched the NHL’ers go through 45-minutes worth of drills on a weekday morning. It was also a big day for Kelowna’s media. Every outlet in town had at least one reporter or photographer at the practice and at least two outlets had three. To put it in perspective the Red Wings probably drew twice as much media attention as the Premier does when he comes to town. 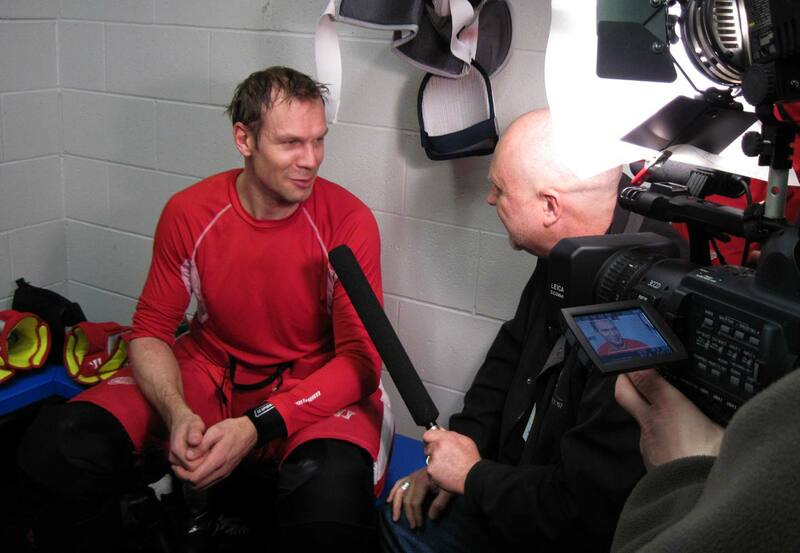 Once the practice was over, us local scribes were awarded our big league moment, a chance to enter the Red Wings dressing room and interview the players. So naturally, being the hard hitting reporter that I am, I asked Detroit’s captain, Nicklas Lidstrom, what he’s doing while he’s here. For some reason, it was the best I could come up with. “Some of the guys went golfing yesterday, a couple of guys went up snowmobiling in the mountains,” he replied, adding later that he was one of the ones who went snowmobiling. It turns out the trip was set up by ex-Red Wing, Brent Gilchrist, who is still friends with Lidstrom, lives in the Kelowna area and is an avid snowmobiler. “We had a great time being up there, almost all day, really enjoying the weather, enjoying the views up there,” said Lidstrom. Surprisingly, Detroit’s head coach, Mike Babcock, had no problems with his players participating in an activity that has been in the news lately because of avalanche related deaths. Instead of giving a pablum answer to a pablum question, Babcock offered a bit of insight. Note: Kelowna’s poor also got a boost from the Red Wings’ visit. Admission to today’s practice was by donation to the Kelowna Community Food Bank and according to a Rockets press release, fans donated more than $25,000 worth of food and another $1,500 in cash. The Detroit Red Wings skate through a drill at their practice before 6,000 spectators at Kelowna B.C.’s Prospera Place on March 17, 2010. 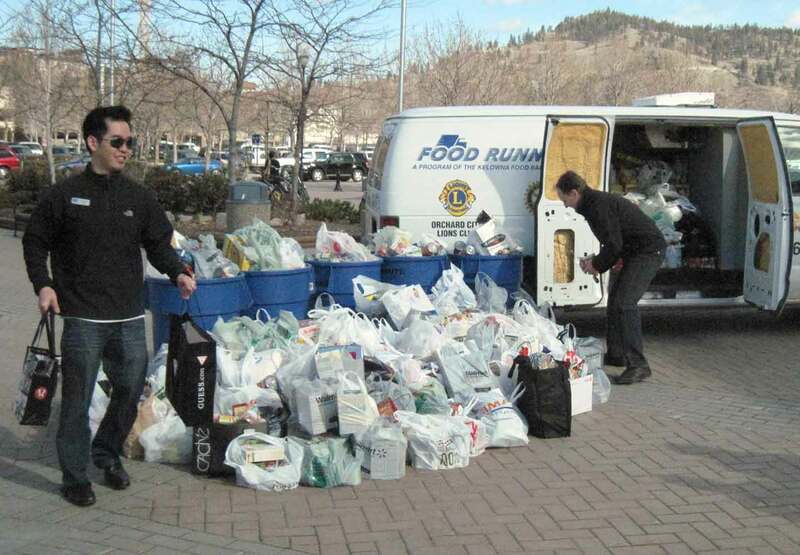 Donations for the food bank are collected before the Red Wings practice in Kelowna on March 17. 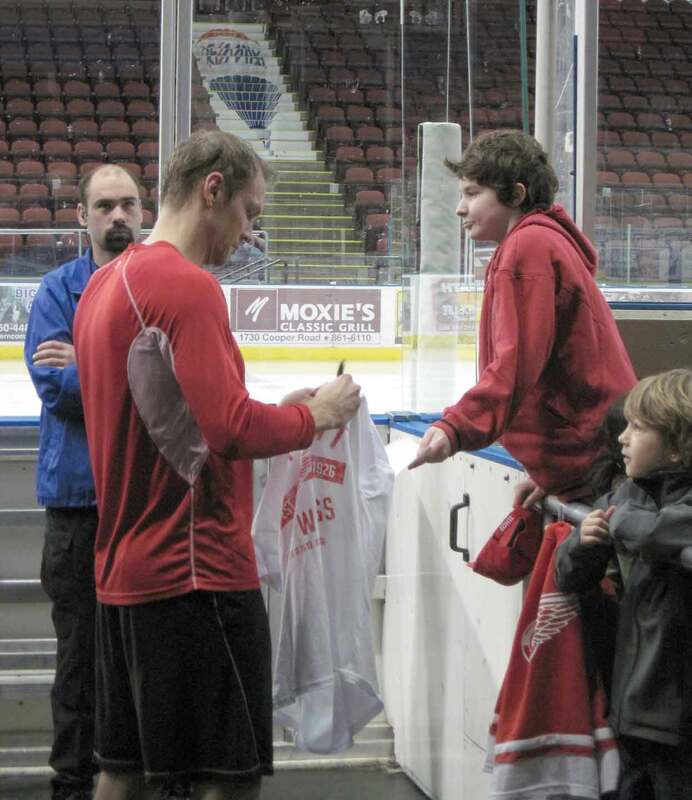 Detroit captain Nicholas Lindstrom signs autographs after the Red Wings practice in Kelowna on March 17. Detroit captain Nicholas Lindstrom does an interview with local media after the Red Wings practice in Kelowna on March 17. Great article. I love Babcock’s honest commentary.